Our Christmas concert for the Riversmeet Benefice at Great Barford was an opportunity to feature the locally-composed music of Thomas Jarman, in his anthems ‘Anthem Proper for Christmas Day’ and ‘Peace On Earth’. We had a capacity audience, and the team at the well-equipped and spacious All Saints Church provided delicious refreshments. This was a first outing for our newest instrument, an eight-keyed Ophicleïde, a metal descendant of the Serpent, which underpinned the bass part in a suitably serpent-like fashion. Our appearance at Melchbourne as part of their charter fayre, celebrating the granting of the charter by Henry III in 1264, involved competition from archery, morris dancing, birds of prey, a flower festival and dancing to the Glenn Miller sound; that’s without the various stalls, bric-a-brac etc. We still managed to attract a sizable audience at times with a lot of interest shown in the historical information about their church dug up by our research as well as enthusiasm for our music itself. 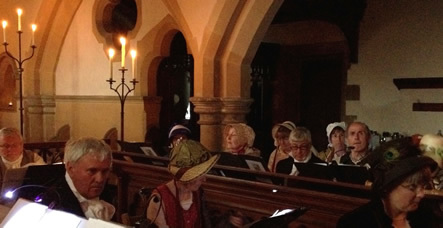 In this delightful country church dating from the Norman era and still lit only by candles our Ascension Day concert reflected the place music occupied, in homes as well as church services, through several hundred years. As daylight faded it was easy to imagine ourselves back in the days represented by our music. We told of the changes in church services and the fabric of the buildings and of some of the composers responsible for bringing West Gallery music to prominence in rural church services. We heard how it was likened to the songs of the gentlemens’ catch clubs by a clergyman of the day and how, as services became more formal, it eventually became unpopular and gave way to organs and surpliced choirs. Here's what they said. Two performances of 'A Truly Traditional Christmas' in which Christmas tales and talks on our instruments and costume put our music into context. The hymns, carols and secular pieces of long ago were interspersed with poems and readings. Our Michael Dunckley opened the programme with his own poem, 'The Old Musick', then found himself in the company of Samuel Taylor Coleridge, George Eliot and Charles Dickens among others. Thomas Hardy’s tales and beautiful poems featured prominently as this music, which was dear to his heart, was often referred to in his writings. The picture shows us at Priory Methodist Church where our concert was for the Zimbabwe Victims' Support Fund to provide food for thousands in poverty and hunger. Thanks to the generosity of the audience and the quire a healthy sum was raised. Here's what they said at Priory and Kempston. This delightful listed building, one of only two thatched churches in Bedfordshire, was the perfect backdrop for our concert 'Thy Goodness Crowns the Year'. Our early nineteenth century costume looked particularly fitting in the church which began life as a barn in 1808. Our selection of harvest music interspersed with poems and readings about rural life and the preparations for the feasting which followed the bringing in of the harvest was well received by a very enthusiastic audience. Our Celebration Singing Day, open to visitors, marked the tenth anniversary of the workshop that gave birth to our quire. It was delightful to be joined by friends and relatives of quire members, friends from within the West Gallery community and some local people new to the genre. The potential pitfalls of putting on a day of music for such a diverse group were neatly sidestepped by our musical director, Ken Baddley. Whilst the pace was quite brisk there was always the offer of going over the lines part by part and hearing them played. Although this was a music workshop it most definitely had a party atmosphere. Two poems, whose authors had been inspired by the quire during its ten years, were read; and of course, there was a birthday cake. A number of members who have since left the area made long journeys to join in our celebration and, judging by the comments of our visitors, we may have recruited a few new ones. Back in one of our favourite venues, our concert, 'The Whole of Musick which His Village Knows' featured the timeless verse of the renowned Northamptonshire poet, John Clare. His attachment to the music of the church bands and singers of the early nineteenth century is apparent in his description, ‘The whole of musick which his village knows, which wild remembrance in each little town; from mouth to mouth from ages handed down’. We performed some of the music which members of these bands laboriously hand-copied into their chapbooks, all interspersed with the verse of the ‘peasant poet’, himself. Here's what they said, and pictures. In what was a first for us, we agreed to perform some old Bedfordshire carols as background music at the Forest Centre as part of their Christmas Tree Festival. We weren’t sure what to expect but were delighted when some of the transient audience sat down to listen, and even more so as others joined them. The icing on the cake was when some of the children, encouraged by two of our sopranos, came to join in and sing with us; the effect on quire and audience was magical. At one point we acquired an assistant musical director, of no more than two years old, who ‘helped’ with the conducting. What an enchanting event! In Quires and Places Where They Sing was a historical account of our music and its place in church services and parish life for St Peter’s Church and Sharnbrook Local History Society. Covering the period from the beginning of the eighteenth century we talked about the music, the composers, our instruments and our costume between performing the pieces. We also told of the behaviour of the old church bands and how they became ‘a thorn in the ecclesiastical flesh’ leading to their decline and disappearance by the late 1870’s. See what they said about us. Thy Goodness Crowns the Year, a harvest concert, featured an account of the huge anticipation and preparations for the festivities which took place at this time of year; the slaughtering of animals, baking of bread and brewing of beer which was carried out in readiness for the celebrations to come. Our selection of harvest music, reflecting the joy of the season, was interspersed with descriptions of country life from William Cobbett and the poetry of John Clare. See what they said about us. We joined with The Friends of All Saints Church in West Gallery from Scratch, a workshop and concert, as part of their Jubilee weekend celebrations. Around sixty participants drawn from the church choir, a local community choir and our own members and friends enjoyed an afternoon of West Gallery music and performed in the concert that followed. Music was provided by Tim Brewster, the church choirmaster and Bedford Gallery Quire. We delighted in bringing back to Turvey music found in The Three Ridges manuscript book which was used in the village around 200 years ago. More workshop pictures. Three performances of our ‘Thomas Hardy and West Gallery’ concert featuring some of the beautiful poetry in which Hardy mentions this music which was so close to his heart. Readings included ‘A Church Romance’ in which he describes love blossoming between one of the ‘music-men’ in the gallery and a certain ‘her below’ and other poems which describe the importance of the music in his own life and that of others. We used extracts from his novels in which his characters speak of their attachment to the music and we brought to life the many tunes he mentioned by name. Also included were ‘Here’s a Health to All Good Lasses!’ a glee on which Hardy based one of his poems and a musical setting of his poem ‘Great Things’ in which he considers the enduring nature of the greatest pleasures of his life. Throughout his writings his intimate knowledge of West Gallery music, a term invented by him, shines through and we performed ‘his choices’ with the same affection in which they were held by the great writer himself. We are shown above and below in the gallery and performing at Wollaston. 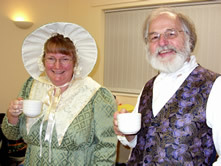 Above right, two members relax during the interval at Blunham and pictures of Rushden are here. Here's what they said about us. We brought our latest concert to our home town with a performance for The Friends of the John Bunyan Museum and Library. It is here that the manuscripts which form most of our repertoire were found and are still on display. The Friends enjoyed our historically accurate rendition of the events of late 1788 when the health of King George III was the subject of so much anxiety and early 1789 when he was thought to have recovered. Our account is portrayed through the eyes of members of a rural church band who sing, first the songs of concern and later those of gratitude and jubilation. 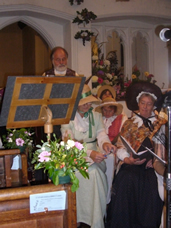 Another performance of ‘Happy Beyond Description’ in which the members of a rural church quire and band hear of the deteriorating health of King George III from his physician, Sir George Baker; Miss Fanny Burney, novelist, diarist and playwright, and James Leach, composer and member of the King’s Band. The quire members respond with dismay and concern as they hear his distressing condition described. When they learn of his ‘recovery’ in 1789 their rehearsal is given over to patriotic songs of jubilation and praise. Pictures. And here's what they said about us. A rousing canon was a fitting start to this concert of music, Christmas tales and celebrations of the West Gallery period. The hymns, carols and anthems of Christmas long ago were interspersed with readings from Samuel Taylor Coleridge, George Eliot, Charles Dickens, Henry Wadsworth Longfellow and William Hone. Directly after the interval our 1833 mumming play provided a contrast, with Saint George as enthusiastic as ever to rid the world of dragon, Turkish knight and giant but finding the doctor equally keen to restore them to health. Thomas Hardy’s tales and beautiful poems featured prominently in the second half as they so often refer to the old church ‘musicianers’ we take such pleasure in portraying. Pictures. What they said. A barn dance to raise funds towards the purchase of the historic instruments which help us to achieve the authentic sound of the West Gallery period. Quire members and friends danced to the Orange & Blue under the watchful eye of caller, Liz Rose. Entertainment was provided by our clarinet trio, David, Jack and D-J Wilcockson. Sue Melvin clogged for us and some very appropriate and funny songs were expertly delivered by Roy Hollowell. Ken Baddley and Graham Lyndon-Jones explained and demonstrated some of the instruments already in use in our concerts and by enjoying a super evening we raised a healthy amount towards future acquisitions. We began with a rousing canon before demonstrating the late 17th century practise of ‘lining out’ in which the parish clerk would laboriously chant each line of a psalm for the mainly illiterate congregation to repeat. We then stepped back in time to do some of the beautiful pieces which were sung in the homes of the nobility and gentry in the 16th and early 17th centuries before we moved on through our beloved West Gallery period to the present day. Our performance encompassed unaccompanied American shape-note pieces of the 18th and 19th centuries, Primitive Methodist ‘ranter’ pieces complete with concertina, tambourine, euphonium and our 1830’s keyed bugle before concluding with pieces by living composers in the shape-note tradition. A truly joyous romp through several centuries of a village’s religious musical history. Pictures. What they said. Our hosts had asked for a concert with some 'local' historical context and an Advent theme. Though close to Christmas the brief was quite specific; no carols! A nineteenth-century noble cricketing vicar (the Reverend the Lord Beauclerk) with little time for his church or congregation fitted the first part of the bill admirably and some diligent research in our music manuscripts for specifically Advent pieces did the rest. We sang and played to a full church, and took a glass of wine with our hosts without ever mentioning Christmas! Pictures. What they said about us. Another harvest concert but this time the venue gave rise to some impromptu, unscripted dialogue involving a cane! Suffice to say that no chorister was going to risk being out of order. And no, we didn't let our Musical Director take it with him when we left. Among our audience at The Abbey Church was Christine Hunt who later wrote a delightful poem. This concert concluded a special day of celebration to mark the re-launch of the Cowper & Newton Museum following an intensive programme of work over the winter. What they said about us. 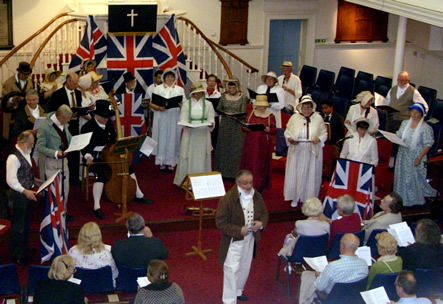 A celebration of 200 years of these two Bedfordshire ‘causes’, bringing back the music which the ordinary local people once sang in their chapels. The quire's performance concluded an annual study day at Bedford School. The programme represented music throughout the West Gallery period linked with historical fact for this expert audience. Here's what they said. 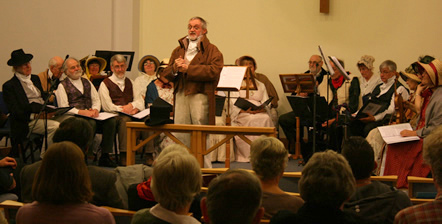 A concert portraying A Georgian Christmas was the after dinner entertainment for a themed event. The singing was linked by amusing historical anecdotes one of which, involving mistletoe, was unrehearsed and left one of our female singers very surprised! A concert based on the evolution of West Gallery music as part of 'Good Afternoon', a series of daytime lectures at Bedford Central Library. A return visit to Stevenage to provide a taste of nineteenth century Christmas pieces. A harvest concert to raise money for 21st century plumbing for this ancient Saxon Minster church. A selection of Bedfordshire West Gallery music was the entertainment between the two halves of the dancing. This was a tour of four of Bedfordshire’s most interesting old churches and chapels, some with galleries, with a picnic lunch at Stevington Windmill, and ending with tea and scones at Roxton Congregational Church. A concert for the Friends of the museum. It gave us great delight to sing in the place where the manuscripts which provide much of our repertoire were found and to be able to benefit the organisation which made them available to us. This concert, part of the Ouse Valley Arts Festival, was enlivened by an account of the heinous crimes of a late 18th / early 19th century vicar of Harrold which we dug out of the archives. A Christmas choral evensong including a local, metrical version of the Nunc Dimittis and the Magnificat sung to a tune found in a 19th century collection by an ancestor of one of our fiddlers. A carol concert sung from a gallery overlooking the grave of Timothy Matthews, a curate of Colmworth. We were lent, and played, the bugle with which he went about Bedfordshire announcing his presence and intention of preaching.